He’s a Mexican-American chef whose food style brings in spice, unique flavors and creativity. When working on the curriculum for our Food Network Favorites theme, I wanted to bring a strong-vegetable dish to our classes. Something that a vegetarian could serve as an entree because it was filling, tasty and satisfying. These Corn and Zucchini Cakes do EXACTLY that. Below is the recipe, but the video makes it easy to follow. Drain the zucchini as long as you can in a colander! We don’t have a lot of time for that in our 1-hour classes, but if you can leave it for 30-60 minutes, a lot of the moisture will escape. Kids love flipping the cakes. Let them have some fun at home! Add more flour as needed. While making the cakes, the batter will become more soggy the more it sets, so add a bit flour as needed about halfway through making the cakes. I’ve got to get back to working on my super secret project that will dramatically help parents like yourself improve your family’s health, weekly meal plans and love of cooking. 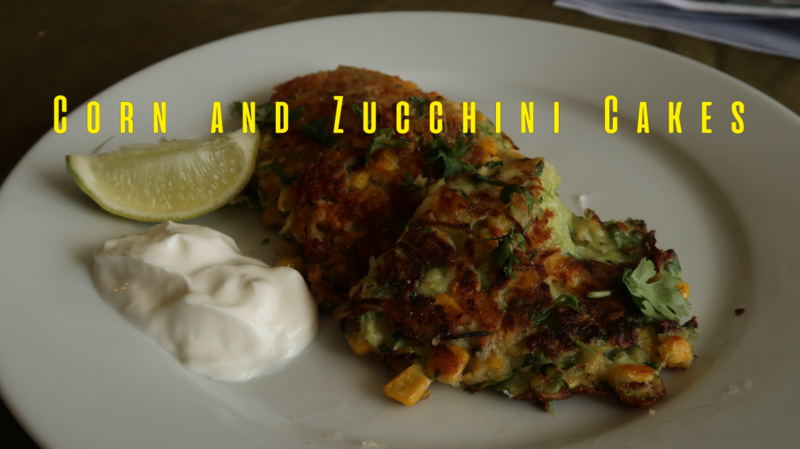 You’ve never had pancakes like this with zucchini and corn…they are delicious! In a colander, toss the shredded zucchini with 1 teaspoon of kosher salt and let sit for 5-10 minutes to drain. Then use your hands to squeeze the zucchini to reduce as much water as possible, then place in a medium bowl. In a bowl add the green onions, corn, egg, flour, juice of 1 lime, 2 tsp salt and pepper and mix to combine. Stir in the squeeze zucchini into the batter, mixing just to combine. In a large pan over medium-high heat, add 2 Tbs olive oil. Add ¼ cup batter and flatten with a spatula, continue 3-4x to add more pancakes to the plate. Cook for 3-4 minutes, until golden brown, then flip and continue cooking until golden brown, another 2-3 minutes. Remove to the paper towel-lined plate and season with a pinch of salt. Continue until all the batter is used, to make about 12 cakes. Serve warm with sour cream.